Authors are ROCKSTARS! : Giveaway Time! How's your summer going? Over here at Authors are ROCKSTARS!, we're still basking in the aftermath of the ALA Annual Conference. We've also been reflecting on the awesome authors we've had the opportunity to meet this year, as well as the exciting interviews we have coming up, and we decided that since things have been a little quiet around here for the past few weeks, it's time for a giveaway! 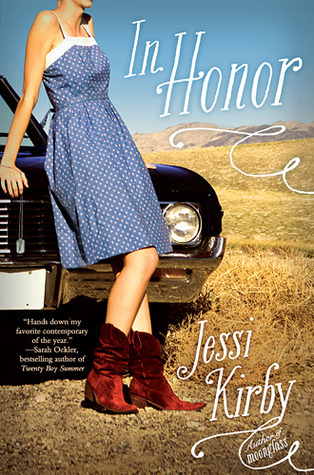 Want to win a signed ARC of In Honor by Jessi Kirby? After listening to the interview with Jessi we shared last month, of course you do! Here's the deal: we'll be chatting with both Kiersten White (along with Marie Lu, Robin LeFevers and Cynthia Hand) on Tuesday and Sophie Jordan on Saturday this week for the podcast. Since we've been fortunate enough to have interviewed most of these authors previously, we'd like to know what YOU want to ask them this time around! Simply comment on this post with a question (or two or three) that you'd like us to ask these talented authors, and that's your entry for the In Honor ARC contest. We'll email the winner for their address, so be sure to leave your email when you comment. EDIT: Please note that questions for Kiersten, Marie, Robin and Cynthia need to be submitted by 9am Tuesday July 23rd. We will be interviewing them at Kiersten's launch party that evening. Oh I've been wanting to get my hands on this book! Plus I love Sophie Jordan! My question is: What's your advice for creating strong, female characters? My question would be something along the lines of is there something you just have to do/have/use while writing or you just can't do it? Also, do you have a treat you reward yourself with after you've reached your writing goal for the day/week/month, or when the book's complete? What do you do when you hit a point when you're feeling frustrated when you're writing? I sooo want to read In Honor by Jessi Kirby!! I would ask Kiersten White, "How does she come up with her ideas for her books?" and I'd also ask, "What other books does she have coming out or is she in the making of another series?" To any of the ladies - if you weren't a writer, what would you be? -Besides the awesome fans, what's one of the most rewarding parts of being a published author? -When you finish the first draft what are your first thoughts? -How do you know when your book is DONE? Where'a the strangest place you've ever had an idea that you wanted to write come to you?